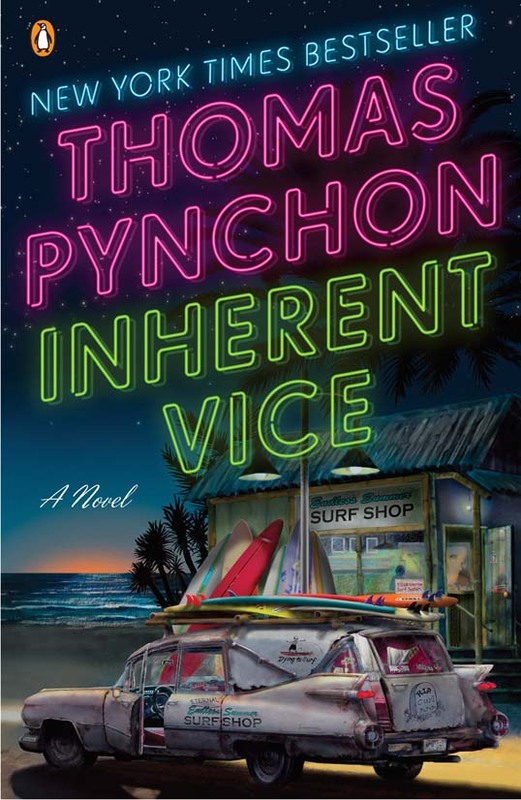 So, last September I read Inherent Vice by Thomas Pynchon because… well, because it is Thomas Pynchon – but more specifically because I had read that Paul Thomas Anderson (Boogie Nights, Magnolia, There Will Be Blood, The Master) was making a film based on the book and I wanted to experience the text first. Pynchon has occupied a great many of my thoughts and a large part of my time ever since I first picked up a paperback copy of Gravity’s Rainbow at the KU Bookstore in 1976 or so (I was not able to finish it for a quarter century – not until a summary, an online page by page annotation, and wiki helped me keep the characters straight). I have read most of the rest of his oeuvre (still have an unopened copy of Bleeding Edge on my bookshelf) and am most assuredly a fan. Up until I read Inherent Vice I considered Pynchon’s fiction to be unfilmable. After reading it, I agreed with PTA in that Inherent Vice was only almost unfilmable. He had tried to adapt Vineland into a movie, but realized that was impossible. Because of business and inattention to the Internet, I missed the Dallas showings of the film in December, but finally a wider release was in the offing. My son and his friends saw it over the initial weekend, but I wasn’t able to fit the time in so I decided to go after work. On Monday I logged into the Alamo Drafthouse website (it’s only a stone’s throw from my house and my work) and bought a ticket for that evening. I was tired and it was bitter cold and I knew that if I didn’t buy it ahead of time I would wimp out after work and go home and sleep. The Alamo Drafthouse is such a nice experience. You get a reserved seat, craft beer (Temptress Baby!) and the food isn’t bad at all. I ordered a hamburger – a Royale With Cheese, of course. Alamo’s policy of no talking and no cellphones is certainly a welcome perk. So… how was the film. If you are a fan of Paul Thomas Anderson you will be disappointed. This isn’t a PTA movie; it is a Pynchon movie. PTA’s movies can be weird (Frogs!?) but this one is WEIRD. What makes it crazy making if you don’t know what to expect is that he sets the stage with so many familiar tropes and then abandons them without a moment’s hesitation or regret. From the trailer you might think that it is a detective story – about a search for a missing billionaire and the detective’s old girlfriend – hoary old familiar plot devices -, but from the book I knew that this is a feint – that nothing is going to be explained, nothing is going to make sense, and the mystery will fade away rather than be resolved. What the hell exactly is The Golden Fang anyways? You might also think that this is going to be a druggie comedy in the style of The Big Lebowski. There are elements of that – but the comedy is overshadowed by Pynchon’s signature paranoia and despair. But, that said – I thought it was great. It is the kind of thing you will like if you like that kind of thing. Despite the ending being changed and large sections of the novel excised (you have to do this to get a tolerable running time) it is amazingly faithful to the book – for good and bad. What was crazy for me is the way the characters speak. I have been reading Pynchon for so long I am very familiar with the unique language a Pynchonian character uses – his cadence, style, and subject matter. I have been reading these letters on the page and hearing them in my head for decades. Now, to hear these words coming out of another human being’s mouth was astounding. I could only shake my head at this ephemeral world of imagination now come to life on the silver screen. This entry was posted in Film and tagged inherent vice, Movie, paul thomas anderson, PTA, pynchon, Review. Bookmark the permalink.